Without a strong value proposition, it’s much harder to sell your products or services in today’s economy, much less even get in the door of big companies. 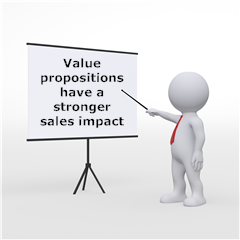 But what is a value proposition? And how is it different from other commonly used terms? A value proposition is often confused with an “Elevator Speech” or a “Unique Selling Proposition.” It’s essential to understand the difference between these terms because their purposes and sales impact are very different. Its primary value is to create competitive differentiation. A USP is often used in marketing materials or in talking with customers who are ready to buy. Helping customers understand your USP is imperative when they’ve already decided to make a purchase decision. But USPs have absolutely no impact when customers are satisfied with their situation or when they’re frustrated but haven’t yet decided to change. USPs are far more effective in the business-to-consumer market than in business-to-business sales. Both the elevator speech and the USP are cousins of the value proposition, but there is one vital difference: they lack the punch of a value proposition when selling to the corporate market.